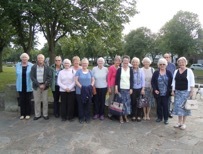 On a lovely sunny day, we visited Port Sunlight Village. After a coffee break we browsed around the shop. We entered the museum to see the exhibits detailing the history of soap making. Lord Lever founded the village, building homes, a school, a church and also providing healthcare for his workers. We watched a short film explaining what life was like for some of the people who worked and lived in the village. There was the opportunity to visit the Lady Lever Art Gallery dedicated to Lord Lever’s wife Elizabeth. We toured the village on the bus with our ‘Sunlight’ guide who pointed out the different styles of architecture and places of interest en route including the magnificent war memorial in the centre of the village. We had time to wander around and some who visited the church were lucky enough to hear the organ being played. There was time to squeeze in tea and cake at the garden centre before boarding the bus. It was a thoroughly enjoyable and interesting day and thanks go to Joan and Jill for all their hard work arranging the trip.